Although SAP Authorization concept has been widely followed in many software development environments, some of the enterprises are still facing issues to understand it. They often think that the purpose of SAP authorization objects is to restrict certain organizational levels and they can protect SAP systems by removing and assigning transaction codes to users.The reality is however completely different. 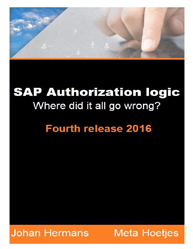 Read this informative whitepaper on “SAP Authorization Logic - Where Did it All Go Wrong?” and learn about: How can you successfully implement the SAP authorization strategy? What are the actions which are subjected to SAP authorization checks that are performed before the start of a program or table maintenance? How can ABAP authorization concept protect the SAP systems from unauthorized access? What problems arise due to explicit authorization model that SAP designed for ABAP? What are the risks involved in the SAP security and how to mitigate them? Download this whitepaper that provides insights in SAP authorization logic, the logic and illogic of transaction codes and SAP authorization objects, the access path and an evolving approach for your GRC solutions. Which ERP Architecture Best Handles Business Change? ERP systems are the technology backbone of the modern business, and as such, the process of matching the "right" system to specific business needs is extremely critical. Most companies spend quite a bit of scarce resources (time and money) on defining the business requirements and then evaluating the potential systems for a close functional fit and for the potential up-front (implementation and license) costs. The new branding – Unit4: in business for people – is clear and emphasizes the focus on people-centric organizations in the professional services, public services, not-for-profit, and higher education industries in contrast to the product-centric, or bill-of-materials-centric approach of many Unit4 competitors. Corporations across the full spectrum of industries have been planning and executing projects since their founding. Across the passage of time methodologies and processes mature, tools are introduced and enhanced, knowledge is acquired and shared, practices (both good and bad) become ingrained into the corporate culture. For many of these businesses anything greater than a minor change to the status quo presents a major challenge, especially if the change is not sponsored by Senior Management and the benefits are not readily identifiable and quantifiable by those impacted. If the architects of change fail to address the critical question that is asked or implied by all interested parties and stakeholders, “What’s in it for me?” the initiative, whatever it is, will be at severe risk of failure.